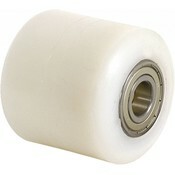 These nylon pallet rollers can handle up to 950 kg per wheel. This makes them ideal for all sorts of industrial applications. Check out our website for our complete range. Our nylon pallet rollers with precision ball bearings are ideal for pallet trucks transporting heavy loads. 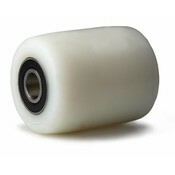 The pallet rollers are made from a nylon or steel roller with a polyurethane tread. This ensures a long life, even in an industrial environment. Pallet rollers are mostly used as castors for forklift trucks, pallet trucks and stackers.